It doesn't matter how popular they are, they're pretty ugly. 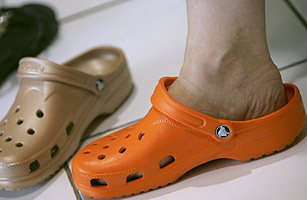 Crocs, introduced in 2002, mostly take the form of rubber clogs but have been transformed into high heels and loafers. Their manufacturing company announced on April 26, 2010, that it would also start making ballet flats. "If we make it a little bit more stylish, then we start to appeal to a larger audience," said the company's CEO. Which means they just might be attractive enough to do your laundry in.